The Center for Virus Research will host it's second annual Career Symposium, that promises to be a great event and will feature Professor Thomas Shenk from Princeton University as the keynote speaker. 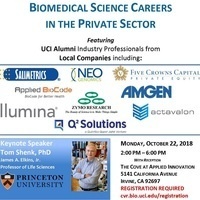 The keynote address will be followed by a panel discussion by several alumni from UCI who are working in biotech and other parts of the private sector. We will also have open table discussions with additional industry professionals, all of whom were trained at UCI and are working at different companies in southern California.